Leea is lovely to work with and had a great deal of respect for my animals and me. She is very patient and both the dogs and I appreciated that! I have worked with other trainers and found her to be the best. I would highly recommend her for any dog training. Watching Leea work with the dogs gave me the incentive to full participate in the classes. Understanding why she was doing a particular thing was much different than just giving commands without truly communicating. Leea’s watchful eye and various comments on our dog’s reactions was an education for me. I’ve gained an appreciation of the need to meet each animal where s/he is, and the need to slow down and breathe with the animal. Leea is a very gifted dog trainer. She has immeasurable patience and trains with a calm effective manner. We have been blessed with numerous dogs whom have all had different needs. Leea has effectively helped us deal with each one and has taught us how to transform each one into a loving member of the family and community. 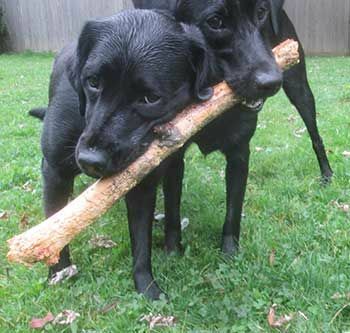 Murph had issues with dog aggression and Leea taught us how to recognize his signals and deal with different situations before they escalated. Sierra had fear aggression issues from coming from an abusive home. With private training we were again able to learn her triggers and help her learn how to work through them. Sierra later went on to get her Canine Good Citizen Certificate. Leea, I have so much to thank you for—I learned more about dogs in the time we spent together than I had ever understood before, and it was mostly just through watching you! I'm more grateful than you can imagine. You've added a deeper dimension of understanding to my life in general, not only regarding dogs. I believe I understand more about what "trust" actually is from watching my dogs with a different point of view. Thank you! I just wanted to tell you how much I enjoyed your class. I have taken obedience classes from other people that were very boring and I although I didn't know any better back then, I didn't like their training methods. Your class was fun and complemented our agility foundation perfectly. 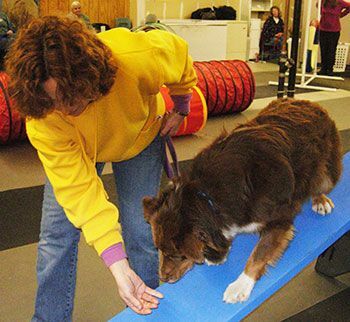 The dogs learn much faster and it is a lot more fun to train using the positive methods. I would very much like to take another class with you. I think you did a fantastic job with our class. The information and training I have received is invaluable. Thank you. Hi there! Not sure if you remember us....Oliver was the Great Dane in training with Smooches and Sugar back in 2005. He was such an incredible dog because of the training he received. He passed away last May at the ripe old age of 9. We just got another [Great Dane] puppy on Thursday and dug out the clickers and your training worksheets. Abraham is catching on quickly. We THANK YOU! We live in New Jersey now and I am glad you are still training. Continuing on with the Level 2 classes made all the difference in the world in getting a great recall and stay when we are outdoors and there is a lot going on. Clicker training class was a fun way for us to learn about our new dog together, as a family, and it extends right into our daily routines at home. This is my first puppy and I couldn't imagine getting started without this class. I learned so many gentle and effective ways to train and my puppy loved the experience of learning and playing in a safe environment, thank you. Beginners class was great. We covered the training so thoroughly with practice in class and the handouts for home. 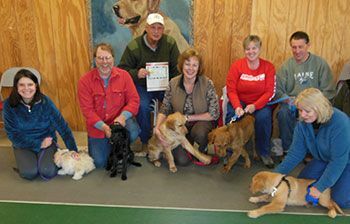 Leea’s knowledge and patience with all the dogs made this a great obedience class. It was fun and extremely practical. Everything I learned will be helpful in getting my dog to focus his attention and improve our relationship. Juno is doing great. He has calmed down significantly to become an ideal companion for us. The training techniques you taught us have become an integrated part of our care for Juno and have really helped us bond much more with him. I now have the confidence & ability to handle high energy situations seamlessly and without incident. He is also wonderful when we have guests. I hosted my book club at our house a couple of days ago and Juno was awesome with all of my friends. Once everyone settled in, Juno just hung out on his favorite couch, getting up every now and then to “check in” with the girls. They were totally charmed! Thank you so much, Leea, for all of your help and support. We could not be happier with our little man! I now have a much better understanding of working with dogs and know what you taught me will help me and the dogs at the shelter where I volunteer. 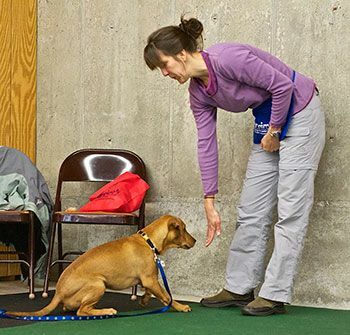 Rather than being nervous about meeting other dogs, I now look forward to trying the techniques we learned in our sessions. Both my dog and I have much more confidence. 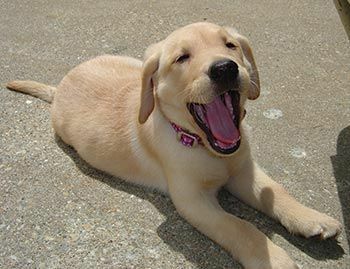 Memphis is our current project who is very energetic and has difficulty focusing for more then 5 seconds. With private training from Leea we have been able to calm him down over the past 5 months, to the point where he can focus and learn. I have recommended Leea to many friends whom have all had success. She can work wonders with all types of different issues. She has a gift that we are happy we found. Last September I called you in a panic because I was going on vacation and was worried about my three dogs and the anxiety they have whenever I go away. They usually stop eating altogether and tear up everything they can—even with a live-in sitter. It has been so bad that I have had to shorten my trips. You gave me great suggestions that I began to implement before I left and the dog sitter continued while I was away. Your ideas worked like a charm. When I got home they were well fed, happy to see me, and calmer than when I left them. Thank you, now I can take a trip without taking a guilt trip! I know the dogs will do fine and be happy. I loved the one-on-one training sessions. There was time for all of my questions and we could go at a pace that really worked for me and my dog. We learned so much especially how to walk nicely on a leash and stop jumping on everyone. 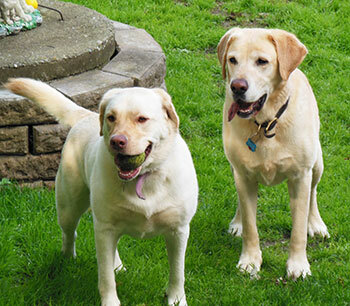 You worked with me and Lily two summers ago on dog reactive behaviors. I just wanted to take a moment and say that you really helped me understand her triggers and how I could move her forward by myself after we left. I have continued with your suggestions and she is doing wonderfully! I found a good agility center locally and Lily has been taking classes and now prepping for competitive trials. She loves it, and does just fine in class with all these high energy, intact collies next to her. She was pretty much born to do agility; her "poodleness" has definitely come to the surface. Those long, athletic legs are now doing constructive things instead of lunging at every dog in the neighborhood with a death wish. Two years ago, she never would have been able to do this. Thank you for your guidance. Ollie seems to have had a breakthrough around kids and men. He's not 100% reliable but he is SO SO SO much better. Spent a whole day with my nephews and after awhile I took him off his leash and everything was totally peaceful. Today we had our first pick-up day at the farm, with cars and people and kids of all shapes and sizes in and out and he maintained his composure throughout. I am so pleased, and we will keep working and paying attention. Thank you for all of the instruction and coaching that got him here! Max had terrible separation anxiety and I was out of options. My veterinarian recommended I contact you. His anxiety lessened after the first session. By the 4th session he was relaxed and happy with no more chewing things up and no more house soiling. Now if Max has occasional accidents, I can pin point why, and make simple adjustments. When Max looks at me with his big brown eyes I imagine he’s saying, “Thanks for a second chance at my life.” Thank you for believing in both of us. While I’ve always been good at the obedience stuff, when it came to other dogs I’d get so upset that I’d be out of control, barking and lunging and just beside myself. Mom had to plan all our walks carefully so we’d avoid other dogs and there were some places we just couldn’t go. But tonight is different and so am I. I’m relaxed as I join the class. My tail has a friendly wag. I exchange hellos with the other dogs. I’ve worked hard to learn to be comfortable around other dogs. We started off with private training and then began attending Leea’s group classes. My confidence is growing and I have more opportunities to practice good doggie social skills. I’m starting to enjoy seeing and meeting new dogs. Thanks! The man who set me on fire always wore work clothes, a baseball cap and boots. With time you showed me that not all men dressed like this were to be feared. There was a difference in Buddy's behavior after the first visit. I am no longer concerned about attacks and painful biting. Thanks to TTouch and Leea's invaluable training advice, our home is happier. Behavior problems in my Jack Russell terrier were completely gone after private training. He is no longer aggressive around other dogs and he generally seems more calm. I was just reading through the TTouch hand-outs again and wanted to send a note letting you know how much I enjoyed taking your workshop with Chester. I really like the philosophy behind TTouch including respect for animals, being present to them, and better understanding and managing the stresses they may face. I can see the difference it has already started to make with Chester and I'm trying to find ways to use the bodywork tools with him on a regular basis. I have to thank you for teaching the TTouch classes. I feel confident that Mika’s daily aches and pains that came with age were minimized and kept her strong and moving to the end. 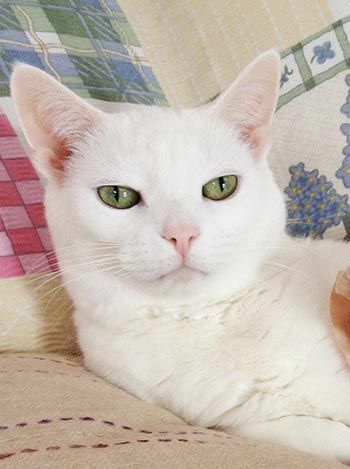 I am grateful to you for opening the door in what proved to be so beneficial to Mika's comfort. It always made me so happy when people were amazed how old Mika was. They would ask about her arthritis and I always would mention you and TTouch, and the skills that you taught me. Most friends didn’t believe I had a cat because they NEVER saw him, Maurice always hid. Then Leea came, joined him in the closet, and began TTouch. What a change! Now he settles right in the middle of my company and offers his belly to be rubbed. While TTouch helped to correct a very difficult situation between my cats, I feel it offered more than just behavior modification. I have developed greater sensitivity and understanding of my cats. I continue to enjoy spending time working with them and look forward to our daily TTouch sessions. 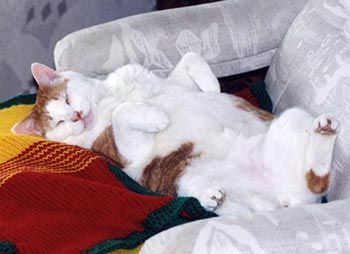 TTouch has become relaxation time after a busy day. It is an opportunity to deepen the relationship I share with my companion animals. TTouch is not just for my cats, it’s for me too. 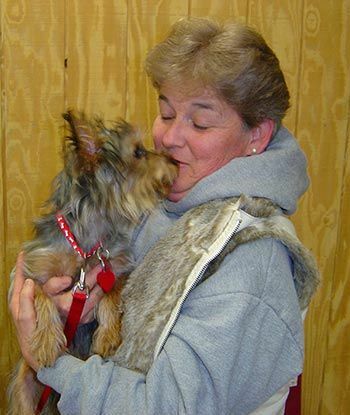 I found this program to be greatly beneficial to my work with rescue and shelter dogs. I saw results for the dogs we were working on the same day! A great introduction to TTouch. 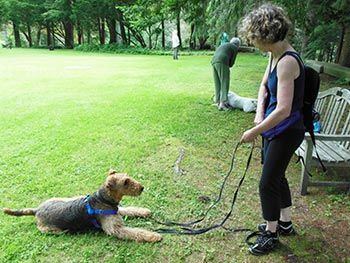 The knowledge I've gained from this TTouch workshop will enable me to prolong and enrich my dog's life. 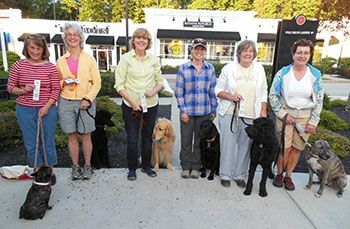 As a seeing eye dog user, these techniques will have a profound effect on my and my dog's life. I am forever grateful.